Spring is just around the corner. That’s what I keep telling myself. This country wide Arctic Blast needs to leave! I guess that's why I fell in love with this little sprite at Sweet Pea Stamps (SPS). Today I have created a 5½” square card with the spring season in mind. I would like to introduce you to Mitzi Sato-Wiuff’s Bluebell Sprite. I have fallen in love with Mitzi’s sprites. They are so much fun to color, regardless of your medium of choice. SPS has them in rubber stamp format. Please check them out here. 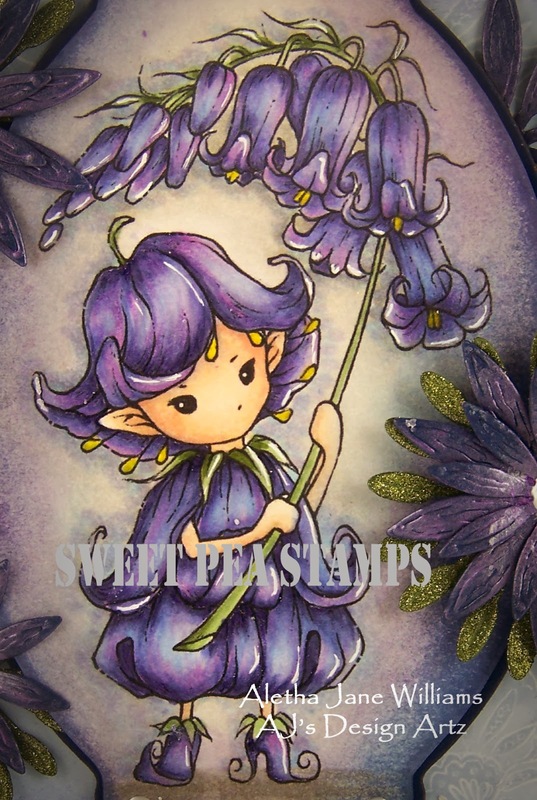 Bluebell Sprite was first colored with Copics. After the coloring was complete I trimmed her with Spellbinder’s Labels 10 and distressed the edges and most of the back ground with Distress Ink in Faded Jeans and Dusty Concord. The cardstock, Night of Navy and Brocade Blue, is Stampin’ Up!, as is the designer paper from the Paisley Petals collection. I am really getting into making my own flowers, but still need a lot of practice. These little charmers were cut with Spellbinder’s new Die D-Lites. Bottom layer is cut with Blooms One and painted with Moss Green Viva Décor 3-D Stamp Paint. Top layers were created with Blooms Four. For that added glitz I painted the Blloms Four with Orchid Liquid Pearls. For the finishing touches I added some White Opal Liquid Pearls to the center of the flowers and the scalloped edge of the Labels One die cut. Our January challenge at One Sweet Challenge is up and running. The theme is “black and white.” This means no colors, just black and white, gray is acceptable. There’s another challenge out there, Sweet PeaStampers. Their theme is anything go. I know that there are plenty of Sweet Pea fans out there, so if you create a little piece of art using a SPS image, we would love for you to show us your little piece of art in our SPS Facebook group. 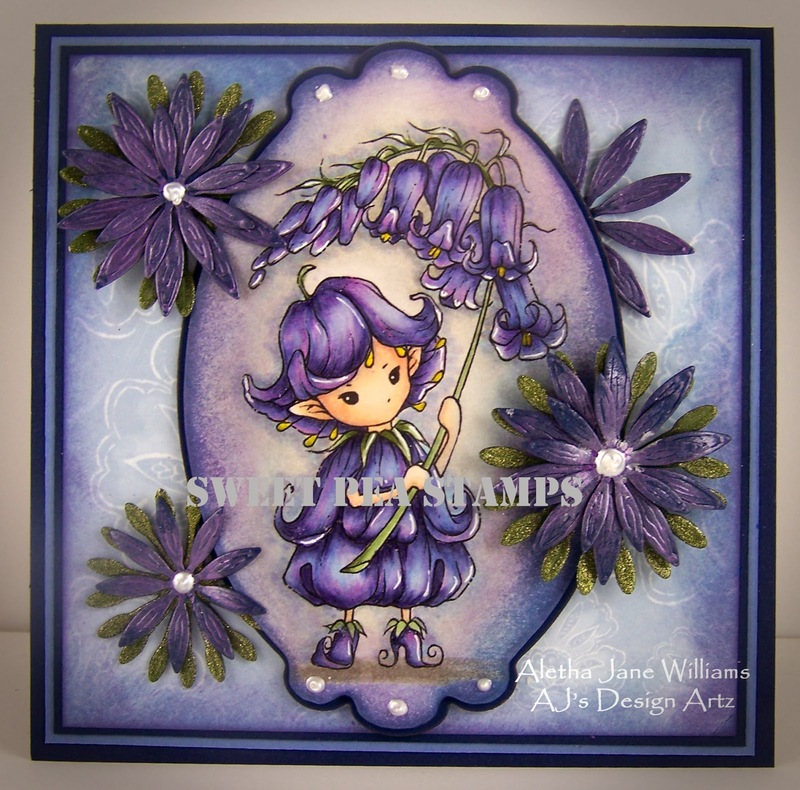 Aletha, your card is just gorgeous! I love your colouring & colour choice! Thanks for playing in the Anything Goes Challenge at The Crafting Cafe this month! More gorgeous purple colors. You are so talented! A lovely card and image, thank you for joining our 4th Challenge at Crafting From The Heart, good luck. We hope to see you again soon. Great card, I love the image. Thank you for joining in the Anything Goes Challenge at The Crafting Cafe this month! Beautiful card! Thanks for joining us at cards und more.